Neesham was looking dangerous and was dismissed on 44. India felt MS Dhoni’s absence in the third and fourth ODI against New Zealand. The hamstring injury kept him away from the game and the veteran was back for the final match of the series. But he didn’t have a great outing with the bat courtesy of Trent Boult who bowled a peach of a delivery to castle. However, Dhoni made his presence felt behind the wickets to scalp a key wicket of James Neesham. The incident happened on the second ball of the 37th over when Neesham missed the sweep shot off Kedar Jadhav’s bowling. A huge appeal from the wicket-keeper and the bowler followed even as the batsmen tried to sneak in the run. Meanwhile, the ball went behind the stumps and Dhoni, along with appealing had an eye on the ball as well. He was aware of the batsmen going for a single and upon collecting the ball, he sensed a chance. Neesham was out of his crease trying to steal a run and MS Dhoni affected the run-out with a direct hit. 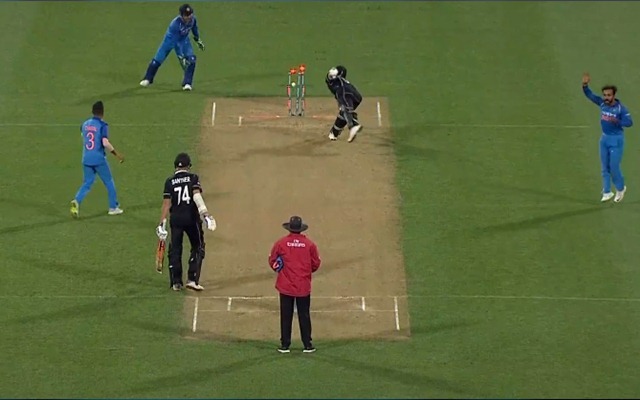 As soon as the ball hit the stumps, MS Dhoni was so sure of the wicket that he started celebrating with his teammates and the replays confirmed that James Neesham was well outside the crease. It was a timely wicket for the visitors as the left-hander was looking dangerous batting on 44 runs. He was slowly taking the game away from India and a few lusty blows before the over had made them nervous. In the meantime, the Men in Blue are looking the favourites to seal the game in Wellington. Defending 252 runs, they kept taking the wickets at the regular intervals and it has come down to the tail now for New Zealand to chase down the total. Mitchell Santner and Todd Astle are currently fighting it out in the middle.